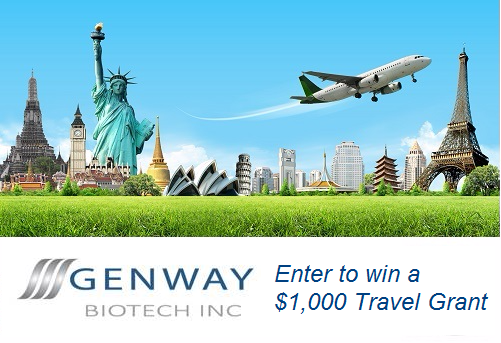 As a leading protein and antibody solutions provider, GenWay Biotech is proud to announce the return of our annual Travel Grant Program! One lucky winner will receive a grand prize of $1,000 for travel costs to any scientific meeting or conference of choice. To enter, please fill out our submission form here. Applicants must travel in next 12 months to a life science scientific meeting. Applicant must complete a brief survey to be eligible. Drawing will occur the first week of November 2018. Limit 1 application per individual. Discounts cannot be used in conjunction with other promotions or special offers. GenWay Biotech Incorporated reserves the right to alter or withdraw any program, offer or promotion at any time. If selected to receive an award, applicant must agree that the applicant’s name, photo, award amount, may be used in announcements or articles (i.e. social media, newsletter) issued by GenWay Biotech. GenWay Biotech Incorporated accepts not responsibility for prize loss or damage.